Back when the Apple Watch was beginning to enter the long, strange process of going from rumor to reality, it had its share of speculation about just what the thing was going to be called. Naturally, many figured that Apple would follow the naming conventions it had established as standard: it began with iPod, then iPhone for the smartphone, iPad for the tablet, and eventually, iWatch. But as it turned out, iWatch was pretty much out of the question from about 2012 forward, and for a reason some might not expect. Reports suggest that back in August 2012, a company in Fresno, California called OMG Electronics filed for the iWatch trademark, with some clear plans to actually do something with said trademark. OMG actually went so far as to run a crowd funding campaign on Indiegogo in 2012 from September to October. OMG's effort went up in smoke, pulling in just $1,434 of a planned $100,000, so the plan to raise “...funds for the development and creation of the ultimate mobile device that has the benefits of a wrist watch” didn't come to pass. But that’s only part of the story. Reports suggest that M.Z. Berger & Co., an operation in New York, applied for a trademark on the name iWatch back in June 2007, but this trademark was ultimately opposed by well-known maker Swatch, who noted that the term iWatch would actually cause market confusion against some of Swatch's currently registered names. What's more, the iWatch name is actually owned by another holder in the European Union—Probendi, a software studio in Dublin—and has been since 2008. 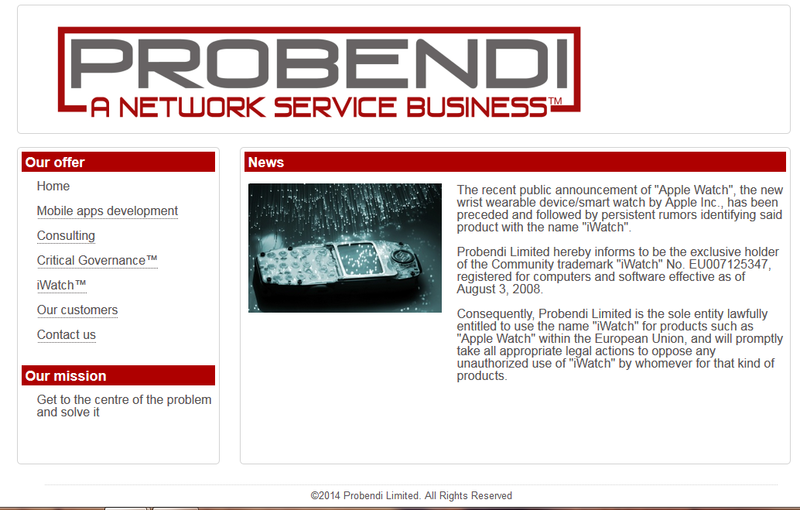 It's a point that Probendi goes so far as to post on the front of its website. Though the change from the i-whatever convention to Apple Watch is unusual, it's not expected to have much impact on sales; reports from Piper Jaffray suggest that Apple will likely sell a million such devices in the first weekend of sales, which is expected to start April 24, as pre-orders start this Friday. Still, when three previous devices have followed the i-whatever naming convention, changing it almost doesn't make sense. But then, this isn't really the first such departure from the i-whatever; consider Apple TV. Some thought, back when it was starting to emerge around 2006, that the name would be iTV—reports suggest it was actually unveiled as a work-in-progress under the name iTV back in 2006—but then that turned out to be a wash thanks to the fact that iTV was the name for a British television network dating back to 1955, and reports suggest that ITV—the network—was set to take legal action should Apple go ahead with the name. Still, a technological advance by any other name should still bring in plenty of users and work well, because whether it's iWatch, Apple Watch, or George, it's still going to have quite a bit to offer its users.